Native Languages Native Cultures What's new on our site today! Welcome to our New York State Facts section, part of an educational project designed to provide information about indigenous people in different U.S. states. Follow the links to the right of our tribal map for more information about the language, culture and history of each New York tribe, or scroll below the map for New York Indian activities including a map of New York reservations, a wordsearch, fact sheets, and words from the Native American languages of New York. Feel free to print any of these materials out for classroom use! But weren't there Algonquin Indians in New York state? No, the Algonquin people live in Canada. They were never in New York. The people who speak about "New York Algonquins" have confused the word Algonquins with the word Algonquians. Algonquian is a general term which is used to refer to dozens of tribes with related languages. Algonquin people speak an Algonquian language, but so do Chippewa and Cheyenne people. 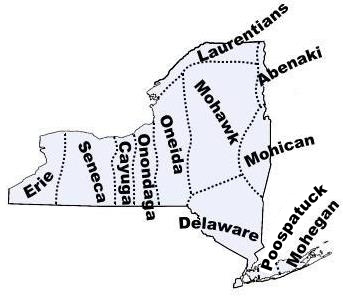 Algonquian-speaking tribes in New York include the Mohican, Mohegan, Munsee Delaware, Abenaki, and Poospatuck tribes listed above. There are eight federally recognized Indian tribes in New York today. New York Tribes Word Search: Printable puzzle hiding the names of New York's Indian tribes. New York Language Greetings: Learn to say "hello" in several Native New York languages. New York Native Animals: Learn the Native American names of New York animals. New York Indian Facts for Kids: Answers to frequently asked questions about the tribes of New York. Mohegan, Montauk, Shinnecock, Mohican and Wappinger tribes. Good book introducing New York's Native American history and culture to kids. Another book on New York tribes for kids. Interesting book about the colonial history of the Iroquois tribes in New York State. An excellent book about New York City's history that includes good material about local Indian tribes. Comprehensive compilation about the Indians of New York. 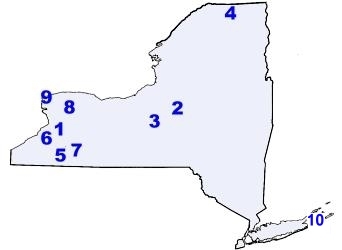 The Native American etymology of various New York place names. The Six Nations: Interesting historical and cultural information about the Iroquois tribes of New York. Would you like to sponsor our nonprofit work on New York languages?